Ultrasonic Testing (UT) of different tubes is a commonly used inspection method. Various techniques are employed for tube examination in order to detect, characterize and size such "abnormal" areas as flaws, laminations, pores, inclusions, material microstructure imperfections, inhomogeneities, grain size variations, areas with high hydride concentration, oxide layers, material morphology changes, etc. However, sometimes the results of the inspection are not satisfactory due to different reasons: insufficient sensitivity, inability to characterize the "abnormal" areas (i.e. determine flaw shape), inability to size the flaw, low reliability, and so on. Typically the pulse-echo (PE) and pitch-catch (PC) techniques are used for tube testing to detect, characterize and size flaws located within the tube wall, on the inside diameter (ID) or outside diameter (OD). (Sometimes terms ID and OD are used in context of inside and outside surfaces, respectively). Normal beam longitudinal waves and angle beam shear waves propagated in circumferential and axial directions are commonly employed. Each technique has its advantages and deficiencies. However, it is very difficult even using various techniques, waves and transducers to characterize the flaw (i.e. determine its shape and orientation), measure shallow flaw depth, detect cracks (particularly the tight ones), find areas with material morphology variations, and so on. Only tomographic method, as the most accurate and reliable one, could allow solving all these problems. Such a method assumes insonification of each area of the tested object from different points and at various angles; in other words, it allows "seeing" each area of the object simultaneously from different points of view. At the same time, tomography is a very complicated and expensive technique; it is now on the development stage only, and the commercial UT tomographs are currently not available. So it is worthwhile at the time being to develop something like "quasi-tomographic" approach to tube examination, which could significantly improve the inspection capability by employing only a few rather simple tomographic techniques. The objective of this paper is to describe the abilities of "quasi-tomographic" UT technique for detection, characterization and sizing of flaws located on the tube inner surface, tube outer surface or within the tube wall. We assume that tube is filled with water, all transducers are positioned inside the tube, and access is possible only from within the tube. Naturally, this or similar technique (with necessary changes, of course) can be used for flaw detection, characterization and sizing in different objects. Tomography is a Greek word meaning "section imaging". At the time being X-ray computed tomography (CT), photon emission tomography, positron emission tomography, and magnetic resonance imaging (MRI) tomography are well known techniques producing accurate images of the internal features of an object, as well as information about the object's geometry and material characterization. The most popular X-ray CT became a widely used diagnostic approach in both medicine and industry. In this procedure narrow beam of X-rays sweeps across an area of the tested object and is recorded by a radiation detector. Tomography uses measurements of X-ray transmission at many angles completely encircling a testing object to compute the relative X-ray linear attenuation coefficient of small volume elements. Data from many such sweeps at different angles and from various points are integrated by a computer, which uses the radiation absorption figures to assess the density of material at thousands of points. The density values appear on a screen as points of varying brightness to produce a detailed cross-sectional image of the internal structure under scrutiny. The clear images of interior planes of an object are achieved without the confusion of superposition of features often found with conventional radiography, making computed tomography results easy to interpret for feature detection, location and sizing. The X-ray tomographic images are much more clear and accurate than ordinary X-ray images. In general, the resolution of a tomograph is many times better than resolution of a radiograph. Naturally, there has been considerable interest in computed tomography with ultrasound. 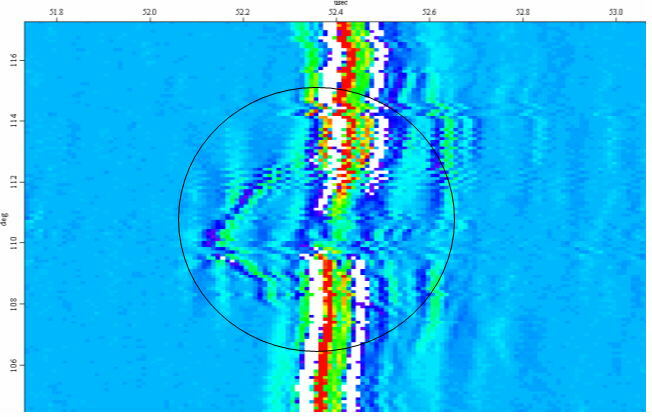 This is mainly due to two factors: first of all, the UT equipment constitutes about 40% of the world market for NDT equipment, and secondly, the ultrasonic computed tomography may generate cross-sectional images (tomograms) of four different material properties. Unlike X-ray CT, which provides only one image depicting absorption coefficient distribution in the object cross-section, method of ultrasonic tomography can generate images depicting acoustic impedance, sound velocity, density, and attenuation coefficient. It is obvious that technique, which gives images depicting simultaneously distributions of four different physical parameters across a cross-section, has significant advantages in detectability, sensitivity, accuracy, reliability, and resolution, thus increasing the probability of detection, characterization and sizing of "abnormal" area by several times. The ultrasonic tomography is based on the insonification of each area of the testing object by ultrasonic waves from different points and at various angles and also on the reception of the transmitted, reflected, refracted and scattered ultrasonic pulses in different points and at various angles too. In particular, the reflection tomogram, depicting acoustic impedance distribution, is of interest for the NDE community, because most industrial objects, e.g. pipelines, tubes, rods, axles, etc, only allow access from one side of the material. During last twenty years numeral papers and books were dedicated to various problems of the UT tomography. However, commercial UT tomographs are still not available. Probably, the main cause is the absence of proper transducers transmitting and receiving the UT waves. In order to realize the potential advantages of the UT tomography (high detectability, sensitivity, accuracy, resolution, etc), one should use narrow weakly diverging acoustic beams (similar to laser beams). 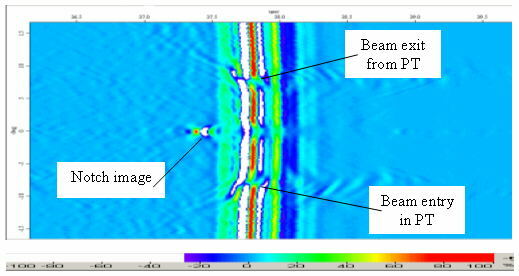 Only such beams, narrow within the specified insonification range, can provide the required inspection parameters, because wide acoustic beams entail significant acoustic noise (due to reflected, refracted, transmitted, and scattered UT waves), give low amplitude responses, and do not allow accurately sizing or locating the internal flaws. The transducers, transmitting such narrow weakly diverging acoustic beams, should be at the same time small and simple to provide all-round insonification of the tested object from different points and at various angles. At present, there are no standard commercial transducers that could satisfy all these demands. Novel recently developed piezo-transducers with "logarithmic" acoustic lenses  can satisfy all the requirements mentioned above. They have a stretched focal zone, i.e. form narrow weakly diverging ultrasonic beam within the required insonification range, thus providing a high lateral resolution. In addition these transducers are single-element, simple, small and inexpensive probes. The potential high-resolution capabilities of the UT tomograph are only possible with the use of these special piezo-transducers. In principle, phased arrays can be used to provide a high lateral resolution. However such arrays are two orders of magnitude more expensive and very complex, while their size precludes close spacing that is required for the tomographic instrument. Even more important, they need complex circuitry and multicore cables. Thus, using small piezo-transducers forming narrow acoustic beams to inspect each area of the object at various angles and from different points, and also applying special algorithm to process the received signals, one can develop the desired tomographic technique. Such UT tomographic method would give cross-sectional images of internal structure of the tested object accurately depicting distributions of the acoustic impedance, ultrasound speed, density, and attenuation coefficient, thus providing a high resolution 2D and 3D images. However, the problem of UT tomograph development is a very complicated one, because such an apparatus is based on the sophisticated hardware (mechanical and electronic) and very special software. So, it is worthwhile to try some simplified "approximate tomographic" method, which will be, on the one hand, rather accurate, and on the other hand, comparatively simple. At present various techniques and probes are employed for tube testing to detect, characterize and size different "abnormal" areas: normal beam and angle transducers, longitudinal and shear waves, PE and PC methods, etc. For example, for pressure tube (PT) inspection in the CANDU nuclear reactors the special CIGAR and ANDE systems were developed [2-3]; both systems have the Inspection Tool with Probe Module containing cluster of different UT transducers. (PT is ZrNb tube 6m long with ID=103.4mm and wall thickness 4.2mm). During inspection, which is possible only from within the PT, this Probe Module moves in axial and circumferential directions inside the PT in heavy water. Each UT probe performs its own function: e.g. the ID normal beam (NB) transducer, focused on the ID, and OD NB probe, focused on the OD, detect flaws located only on the ID or OD, respectively; shear wave angle probes, focused in the middle of the PT wall, detect flaws located on the ID or OD; NB material focused transducer detects flaws located within the PT wall, and so on. Generically, the CIGAR and ANDE systems can perform helical 3D (axial-circumferential) B-scan of the whole PT; after that various 2D B- and C-scans for different transducers can be derived from these 3D B-scans. Every technique has its advantages and disadvantages. For example, the angle shear wave PE methods, performed in clock-wise (CW) and counter-clock-wise (CCW) directions, provide good sensitivity at the detection of small flaw, but does not allow sizing the flaw. On the other hand, the circumferential and axial PC methods, using shear waves propagating at angle within the tube wall, are less sensitive to small flaw detection but often provide rather accurate and reliable depth and width measurement of the flaws. Different techniques and probes used for the PT inspection [2-3] allow "seeing" the flaw from various directions: e.g. NB PE ID focused probe gives the possibility "to look" at the flaw from the ID direction in the reflected longitudinal waves, angle PE and PC probes allow "seeing" flaw almost from the OD direction in the reflected shear waves, and so on. As a result, some flaws (particularly, the most dangerous ID flaws) can be detected and even sized by different transducers, while the other defects can be detected only by one probe (and even this indication is weak and unreliable), but some flaws (e.g. tight cracks, small scratches, weak inhomogeneities, and so on) can be easily missed. It happens, first of all, because positions of all probes in the Probe Module are fixed, and therefore even the most dangerous PT areas cannot be insonified at different angles. Secondly, the images, produced by different transducers and based only on the reflected signals, i.e. these images depict only the acoustic impedance distribution. And thirdly, images from different transducers are not combined together. To improve performance of the system, the Probe Module, where transducer angles could vary, should be applied; or some other method, which allows changing incident angles for different probes, can be employed. In addition, images produced by using different transducers and methods should be somehow interposed or combined. The last but not the least, the techniques, which allow "looking" at the flaw in some new directions, can be used. In general, combining these three ideas, one will get something like a rather simple "quasi-tomographic" method, which allows detecting, characterizing and sizing even the small flaws; and this will significantly improve sensitivity, resolution, and reliability of the inspection. Now implement these three mentioned techniques to detect, characterize, and size the ID flaws in the PT, and discuss them one by one. Schematic of the shear wave two-skip PC technique for PT inspection [2-3] is presented in Fig. 1. Figure 1. Schematic of the circumferential shear wave PC technique for PT inspection. This technique allows detecting, characterizing (to some extent), and sometimes even sizing the ID and OD flaws. The circumferential and axial two-skip PC methods, using shear waves propagating at angle within the tube wall, can provide flaw depth measurement (particularly for the deep flaw). In these techniques the flaw is flagged, first of all, as the signal amplitude drop relative to the signal typically reflected from the tube OD and ID. This is because the PC signal is partially blocked and reflected from the flaw. Secondly, another peak of the PC response may appear due to the signal reflected directly from the flaw. Fig. 1 shows that PC transducers are located at such angles and in such positions that after entering the PT and refraction at the interface water/tube the acoustic beam performs (see color lines) two full skips within the PT wall between the ID and OD before going out of the PT. Using this technique, one can "see" the flaw in reflected shear waves almost from the OD direction. In all Figures presented lower the scans were performed on 900/600 ID axial V-notch 0.5mm wide and 0.5mm deep with tip radius R=0.2mm, see Fig. 2. The unusual shape of notch in Fig. 2 was chosen in order to demonstrate the abilities of "quasi-tomographic" method to characterize the complicated flaw (i.e. determine its shape, position and orientation) and measure its dimensions. Figure 2. Cross-section of 900/600 ID axial V-notch 0.5mm wide and 0.5mm deep with tip radius R=0.2mm. Typical circumferential two-skip PC B-scan of this notch is presented in Fig. 3. This scan was performed using computerized scanning rig with rotary and three axial motions, Winspect software for data acquisition, SONIX STR-81G card, and UTEX UT-340 pulser-receiver. The tube, filled with water, was positioned on the rotary table, and transducers were located inside it. The image shows 2D circumferential scan, i.e. 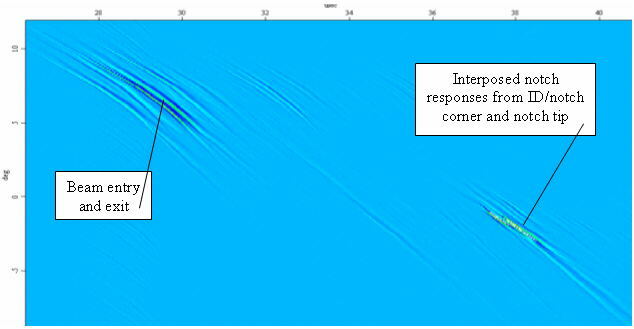 probes moved in circumferential direction, but acoustic beam propagated approximately in radial direction along the trajectory shown in Fig. 1 (black lines are longitudinal acoustic waves in water, color lines are refracted shear waves in the PT). Figure 3. Circumferential shear wave 2D two-skip PC B-scan of 900/600 ID axial V-notch 0.5mm wide and 0.5mm deep with tip radius 0.2mm. Probes: standard CIGAR spherically focused transducers with focal length FL=33mm in light water, center frequency f=10MHz, aperture diameter D=9.5mm, water-path WP=20.6mm, and incident angle 250. The beam is interrupted by the flaw three times: as it enters and exits the tube, where the beam is quite defocused, and at the one full-skip position, where the beam is focused. One can see from Fig. 3, that using PC two-skip technique it is possible to detect notch and estimate [2-3] its width (dimension of notch image in circumferential direction) and depth (difference between UT pulse time-of-flight in radial direction for notch response and main PC response). However, the shape and orientation of the notch cannot be determined. In order to characterize the flaw, one should have an ability to "see" it at different angles. The two-skip PC technique performed at various incident angles allows "looking" at the flaw from different directions, because beam trajectory of shear waves within the tube wall (letter "M" or color lines in Fig. 1) and angle, at which beam hits the flaw (blue line in Fig. 1), depend on the incident angle. The wider "M", the greater angle, at which the flaw can be observed, is. The width of M-like beam trajectory depends on three factors. First of all, it is obvious that "M" width depends on the transducer orientation angle, because this angle directly determines the incident angle of the acoustic beam (angle, at which the incoming beam impinges the PT ID from water, see Fig. 1). The incident angle, in turn, determines the refraction angle (see Fig. 1) and subsequently the "M" width and flaw observation angle. Secondly, transducer positions in radial and chordal directions (see Fig. 1) also affect the incident angle because of the tube curvature. The further probe from the ID in radial direction, the lesser incident angle is. The closer transducer to the ID in chordal direction, the greater incident angle is. Thus, changing transducers orientation angle, distance between them in chordal direction, and their positions in radial direction, one can control the incoming beam incident angle, the refraction angle, the acoustic beam trajectory within the tube and the angle, at which beam impinges the flaw (i.e. flaw observation angle). Special variable angle probe module was used to perform the required scans. This module allows changing the orientation (angle position) of each transducer, distance between probes (i.e. motion in chordal direction), and radial position (motion in radial direction). This variable angle probe module with two transducers working in circumferential shear wave two-skip PC mode was employed to perform the PC scans at various incident angles. Note that only shear waves were used for testing, since they have smaller wavelength and therefore provide higher resolution than longitudinal waves. Because of this, all incident angles were greater than the first critical angle for water/tube interface. The scans, presented below in Fig. 4 at different incident angles, were performed by changing the distance between probes in chordal direction. Analogous results were obtained by doing 3D scans (circumferential-radial), i.e. performing circumferential scans at various radial positions of probes. Both methods allow changing the incident angle, beam trajectory within the tube, and angle at which flaw can be observed. Transducers used for scanning differed from standard CIGAR probes. First of all, their center frequency f=20MHz, thus providing a higher sensitivity and resolution of testing. Secondly, these probes had logarithmic lenses  and therefore created a stretched focal zone in axial direction, i.e. formed a narrow weakly diverging acoustic beam. Generically, these novel probes much better "fit" the requirements of "quasi-tomographic" technique than standard spherically focused transducers. Figure 4. Circumferential shear wave 2D two-skip PC B-scans of 900/600 ID axial V-notch 0.5mm wide and 0.5mm deep with tip radius 0.2mm at different incident angles. Probes with logarithmic lenses: stretched focal zone FZ=20-50mm in light water, f=20MHz, D=9.5mm. Color scale is shown in Fig.3. Fig. 4 clearly demonstrates that shear wave two-skip PC technique (particularly at large incident angles) allows not only detecting notch and estimating its width and depth, but also determining to some extent the shape and orientation of the notch by using e.g. the following approach. Since the tube dimensions and probes positions inside it are known, one can expand the notch image in Fig. 4 into series of small elements and, applying geometrical acoustics and projection method, determine approximately the location and orientation of each small linear element of notch profile, creating (after two refractions and three reflections, see Fig. 1) the corresponding element of the image. Of course, only very approximately the notch shape, shown in Fig. 2, can be "reconstructed" using images in Fig. 4. However, one should remember that so far it is only one technique, which was used for flaw characterization and sizing. Information obtained by using other methods (see below sections 3.2-3.4), will significantly help to determine flaw shape, orientation and dimensions. Schematic of the shear wave CW PE technique for PT inspection [2-3] is presented in Fig. 5. Figure 5. Schematic of the circumferential shear wave CW PE technique for PT inspection. This technique is very sensitive to flaw detection. Flaws (even the small ones) clearly appear on the B- and C-images as the reflected responses with significant peak amplitude. When there is no flaw, no reflected signal returns to the transducer. However, this technique cannot be used to characterize or size the flaw, because for a shear wave, propagated at an angle within the tube wall, only signal reflected from the flaw corner (see Fig. 5) has sufficient amplitude, while the diffraction signal from the flaw tip is very weak. The CCW shear wave PE method is similar to CW technique presented in Fig. 5, only probe is oriented differently in CCW direction and, subsequently, acoustic beam propagates in the opposite rotary direction. Using these techniques one can "see" the flaw in reflected shear waves almost from the OD direction. Typical circumferential CW PE B-scan of 900/600 ID axial V-notch 0.5mm wide and 0.5mm deep with tip radius R=0.2mm is presented in Fig. 6. The beam is interrupted by the flaw two times: as it enters/exits the tube where the beam is quite defocused, and at the one full-skip position where the beam is focused. Note that the CCW PE B-scan looks similar, only the response is oriented differently, in CW direction. Figure 6. Circumferential shear wave 2D CW PE B-scan of 900/600 ID axial V-notch 0.5mm wide and 0.5mm deep with tip radius 0.2mm. Probe: standard CIGAR spherically focused transducer, FL=33mm, f=10MHz, D=9.5mm, water-path WP=20.6mm, incident angle 250. Color scale is shown in Fig.3. One can see from Fig. 6, that using CW (or CCW) PE technique it is possible to easily detect the notch, but its shape, orientation and dimensions cannot be determined. The strong reflection from the ID/notch corner and weak reflection from notch tip are interposed because of poor resolution. In order to characterize and size the flaw, one should have an ability to "see" it at the different angles. CW and CCW PE techniques performed at various incident angles allow "looking" at the flaw from different directions, because beam trajectory of shear waves within the tube wall (color lines in Fig. 5) and angle, at which beam hits the flaw (blue line in Fig. 5), depend on the incident angle, which in turns depends on three factors: transducer orientation angle and probe positions in radial and chordal directions. The variable angle probe module with one transducer working in circumferential CW PE mode was used to perform the required scans. This module allows changing the transducer orientation angle and positions in chordal and radial directions. The scans, presented below in Fig. 7, were performed at different incident angles by changing transducer orientation angle. Analogous results were obtained by doing 3D scans (circumferential-chordal), i.e. performing circumferential scans at various chordal positions of probe. Both methods allow changing the incident angle, beam trajectory within the tube, and angle at which flaw can be observed. Figure 7. Circumferential 2D CW PE B-scans of 900/600 ID axial V-notch 0.5mm wide and 0.5mm deep with tip radius 0.2mm at different incident angles. Probe with logarithmic lens: FZ=20-50mm, f=20MHz, D=9.5mm. Color scale is shown in Fig.3. Fig. 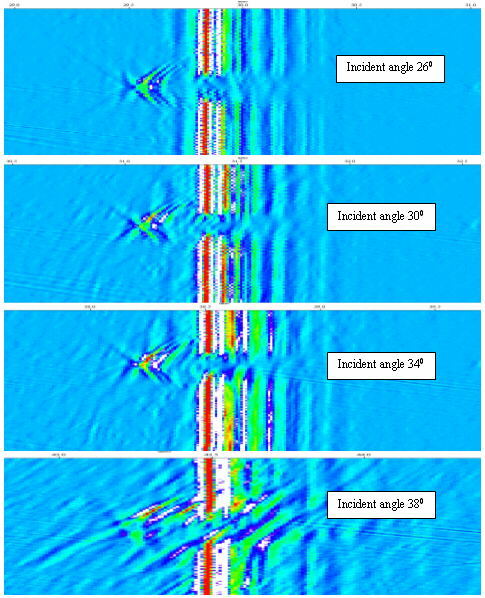 7 shows that CW PE technique at small incident angles allows not only detecting notch but also estimating its depth by measuring time interval between responses from ID/notch corner and notch tip. Since the tube dimensions and probe position inside it are known, one can calculate the notch depth using Fig. 7 images and applying the geometrical acoustics method. Schematic of the shear wave one-skip PC technique for PT inspection is presented in Fig. 8. Figure 8. Schematic of the circumferential shear wave PC technique for PT inspection. This technique allows detecting, characterizing, and sometimes sizing the ID and OD flaws. The flaw is flagged, first of all, as the signal amplitude drop relative to the signal typically reflected from the tube OD and ID. This is because the PC signal is partially blocked and reflected from the flaw. Secondly, another peak of the PC response appears due to the signal transmitted directly through the flaw. Fig. 8 shows that PC transducers are located at such angles and in such positions that after entering the PT and refraction at the interface water/tube, the acoustic beam performs (see color lines) one full skip within the PT wall between the ID and OD before going out of the PT. Using this technique one can "see" the flaw in transmitted waves almost from the OD direction. Typical circumferential one-skip PC B-scan of 900/600 ID axial V-notch 0.5mm wide and 0.5mm deep with tip radius R=0.2mm is presented in Fig. 9. This image shows 2D circumferential scan, i.e. probes moved in circumferential direction, but acoustic beam propagated approximately in radial direction along the trajectory shown in Fig. 8. The variable angle probe module was used to perform the required one-skip PC scans. This module allows changing the angle position of each transducer, distance between probes in chordal direction, and transducers radial locations. This variable angle probe module with two PC circumferential transducers was employed to perform the one-skip PC scans at various incident angles. These scans were done by changing distance between probes in the chordal direction. Figure 9. Circumferential shear wave 2D one-skip PC B-scan of 900/600 ID axial V-notch 0.5mm wide and 0.5mm deep with tip radius 0.2mm. Probes with logarithmic lenses: FZ=20-50mm, f=20MHz, D=9.5mm. Color scale is shown in Fig.3. Fig. 9 demonstrates that shear wave one-skip PC technique allows not only detecting notch and estimating its width and depth, but also determining to some extent the shape and orientation of the notch. Of course, only approximately the notch shape can be "reconstructed" using images in Fig. 9. However, one should remember that using information obtained by different methods, it is quite possible to determine flaw shape, orientation and dimensions. Schematic of the circumferential CW+CCW PE technique with simultaneous transducer rotation is similar to one presented in Fig. 5. However, in this technique now simultaneously with tube circumferential rotation, the probe itself rotates and, as a result, changes incident angle of the impinging acoustic beam. Transducer rotation should satisfy the following conditions. When flaw is located directly in front of the probe, its incident angle should be 00, i.e. transducer works as a NB probe. When flaw is on the left from probe, the transducer incident angle is negative, i.e. it works as a CW probe. When flaw is on the right from probe, the transducer incident angle is positive, i.e. it works as a CCW probe. Simultaneous correlated rotations of tube and transducer allow "seeing" the flaw at different angles in reflected longitudinal waves and reconstruct, to some extent, its shape during one circumferential B-scan. It gives the ability to detect, characterize, and size the flaw. Typical circumferential CW+CCW PE B-scan with simultaneous transducer rotation, presented in Fig. 10, was performed on 900/600 ID axial V-notch 0.5mm wide and 0.5mm deep with tip radius R=0.2mm. Figure 10a. Circumferential CW+CCW PE B-scan with simultaneous transducer rotation of 900/600 ID axial V-notch 0.5mm wide and 0.5mm deep with tip radius 0.2mm. Probe with logarithmic lens: FZ=20-50mm, f=20MHz, D=9.5mm, WP=35mm, incident angle varies from -70 to +70 and is correlated to flaw circumferential position. Color scale is shown in Fig.3. 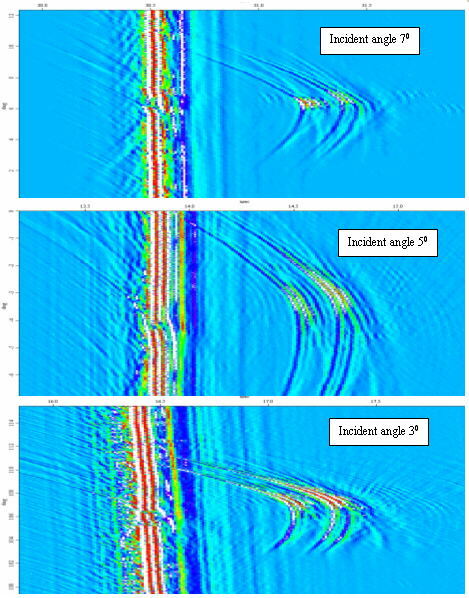 One can see that all three images of the notch, obtained in longitudinal waves propagated from the ID and OD directions, are asymmetric and resemble to some extent the notch shape presented in Fig. 2. The 1st image is result of the direct reflection of longitudinal waves propagated in water in the ID direction. 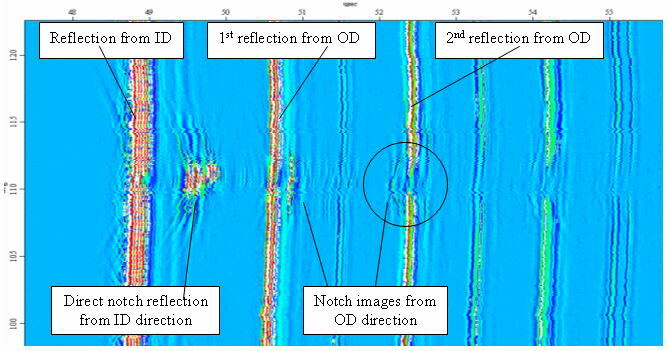 The 2nd image shows how notch looks in longitudinal waves propagated from the OD to ID after 1st reflection from the OD. The 3rd image (circled in Fig. 10a) presents notch view in longitudinal waves propagated from the OD to ID after 2nd reflection from the OD. The 3rd image is the most representative one, since it allows "seeing" the notch in longitudinal waves propagated from the OD at different angles and reflected from the ID. Acoustic beams, forming this image, pass through the tube ID two times, and reflect from the ID one time and from the OD two times. As a result, this image is significantly distorted; nevertheless it shows how notch looks from the OD direction. Moreover, it allows "seeing" the flaw tip and sides at different angles in reflected longitudinal waves and "reconstructs", to some extent, the notch shape during one scan. Fig. 10b presents a zoomed 3rd image of the notch circled in Fig. 10a. It demonstrates that this image somehow resembles the notch shape presented in Fig. 2. Figure 10b. A zoomed 3rd image of the notch circled in Fig. 10a: notch view in reflected longitudinal waves propagated from the OD direction. Circumferential CW+CCW PE B-scan with simultaneous transducer rotation of 900/600 ID axial V-notch 0.5mm wide and 0.5mm deep with tip radius 0.2mm. Probe with logarithmic lens: FZ=20-50mm, f=20MHz, D=9.5mm, WP=35mm, incident angle varies from -70 to +70 and is correlated to flaw circumferential position. Color scale is shown in Fig.3. In order to obtain image, depicting the notch shape more accurately, the circumferential CW+CCW PE B-scans with simultaneous transducer rotation were performed at different ranges and speeds of probe rotation. Figs. 11a and 11b present zoomed notch views in reflected longitudinal waves propagated from the OD direction at two different ranges of probe rotation. These two images, together with image in Fig. 10a, more or less resemble the notch shape shown in Fig. 2. Figure 11a. A zoomed image of the notch in reflected longitudinal waves propagated from the OD direction. Circumferential CW+CCW PE B-scan with simultaneous transducer rotation of 900/600 ID axial V-notch 0.5mm wide and 0.5mm deep with tip radius 0.2mm. Probe with logarithmic lens: FZ=20-50mm, f=20MHz, D=9.5mm, WP=35mm, incident angle varies from -90 to +90 and is correlated to flaw circumferential position. Color scale is shown in Fig.3. Figure 11b A zoomed image of the notch in reflected longitudinal waves propagated from the OD direction. Circumferential CW+CCW PE B-scan with simultaneous transducer rotation of 900/600 ID axial V-notch 0.5mm wide and 0.5mm deep with tip radius 0.2mm. Probe with logarithmic lens: FZ=20-50mm, f=20MHz, D=9.5mm, WP=35mm, incident angle varies from -50 to +50 and is correlated to flaw circumferential position. Color scale is shown in Fig.3. The notch images, obtained using circumferential CW+CCW PE technique with simultaneous transducer rotation, can significantly contribute in determination of shape and orientation of the notch and estimation of its width and depth. Moreover, they might help in evaluation of notch tip radius; see the zoomed images of the notch obtained from the OD direction after 2nd reflection from the OD in Figs. 10b, 11a and 11b. Varying the range and speed of probe rotation and properly correlating it with tube rotation, it is quite possible to get the notch images, which will much better depict the real notch shape shown in Fig. 2. Techniques described in sections 3.1-3.4 clearly demonstrate that ability to observe flaw in reflected and transmitted shear waves at different angles is very useful for flaw characterization and sizing. Of course, the other techniques, employing e.g. NB PE ID focused probe or two PC ID focused transducers, and so on, are extremely useful if one wants to determine flaw shape and orientation. For instance, the NB PE ID focused probe is probably the most important tool for flaw characterization, it allows "seeing" flaw in normal reflected longitudinal waves. Another example is the flaw image in transmitted normal longitudinal waves, reflected from the tube OD. The ability to combine information, obtained by using different techniques and probes, and then reconstruct the flaw, is the main advantage of the classic tomographic method. To do it, the special software should be developed. However, it is so complicated, that at the time being commercially available software for UT reconstructive tomography does not exist. In order to realize the simplified "quasi-tomographic" technique, one should use some other simple method, which could combine information from different transducers. One of the ideas is to connect simultaneously two probes (e.g. CW and CCW) to pulser-receiver working in the PE mode. As a result, both transducers will simultaneously transmit UT signals and both will receive the responses. Each transducer will receive its own signals, reflected from the tube ID and OD, and also signals, transmitted by other probe and reflected from the tube surfaces. Subsequently, three techniques will be realized simultaneously: CW PE, CCW PE, and PC. The obtained "combined" image will contain responses typical for these three techniques; generically, it will look like three interposed images: CW, CCW, and PC. This "combined technique" can be performed as 3D or 2D scans at different incident angles and various probes positions in radial and chordal directions, i.e. at various water-paths WP and distances d between probes. Such a scan, depending on transducers locations, can contain one-skip or two-skip PC image. This method offers a very simple way to "combine" information obtained with the help of different techniques and probes. However, this technique naturally has some disadvantages. For example, since three inspection methods are used simultaneously, the transducer gain cannot be controlled independently for different techniques. The same should be said concerning probes positions and orientation: once set - they are fixed for all three methods and cannot be changed independently. Typical 2D circumferential B-scan of 900/600 ID axial V-notch 0.5mm wide and 0.5mm deep with tip radius R=0.2mm is presented in Fig. 12. This scan has CW, CCW, and two-skip PC responses in one image; in other words, the obtained result looks like the interposition of these three images. Figure 12. 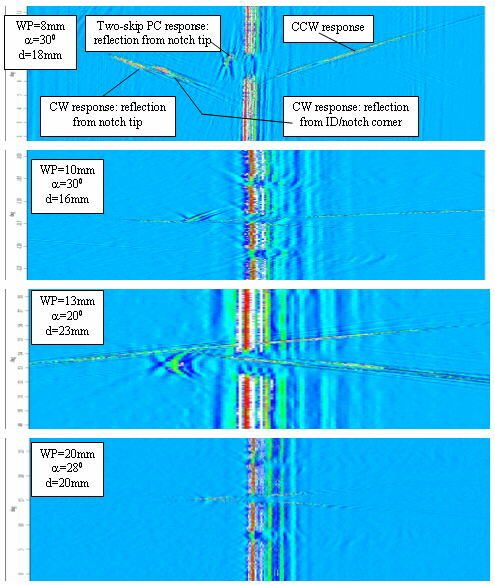 Circumferential shear wave 2D combined (CW + CCW + two-skip PC) B-scans of 900/600 ID axial V-notch 0.5mm wide and 0.5mm deep with tip radius 0.2mm at different water-paths WP, incident angles and distances d between probes. Probes with logarithmic lenses: FZ=20-50mm, f=20MHz, D=9.5mm. Color scale is shown in Fig.3. Fig. 12 clearly demonstrates that the "combined" image, containing the CW, CCW and two-skip PC responses, allows obtaining significant information about flaw shape and orientation. Each single image in Fig. 12 shows the asymmetric PC responses, which means that notch tip is not in the middle of the notch. CW and CCW corner responses are oriented at different angles; it means that angles between notch and the PT ID are different at different sides of the notch. These two angles can be calculated using geometrical acoustics, knowing probes positions and incident angles, and measuring CW and CCW responses orientations. Applying such analysis to each image in Fig. 12, it is possible to reconstruct the notch shape, which will be similar to one shown in Fig. 2. Moreover, since notch tip reflection is rather strong (see PC and PE tip responses in Fig. 12), it means that radius of the notch tip is pretty large. For small tip radius (i.e. for "sharp" notch) these reflections would be weak. Preliminary experiments, performed on notches with various tip radii, confirmed that amplitude and length of the responses are proportional to magnitude of notch tip radius. Therefore this method can probably be used for flaw tip radius estimation. Since transducers with "logarithmic" acoustic lenses, forming narrow weakly diverging ultrasonic beams, are used in our case for "quasi-tomographic" testing of tubes, they should be focused differently in tube circumferential and axial directions because of the additional focusing provided by the cylindrically concave inner surface of the tube, which works actually as a second focusing acoustic lens. This is applicable to all NB and angle probes used for tube inspection, but it is particularly important for angle transducers, because their acoustic fields within the PT are significantly distorted after refraction at the surface water/tube. The required probe should contain a rectangular piezo-element with acoustic lens cylindrically focused in both lateral directions - azimuthal and elevation - with different curvatures. The lens curvature (and subsequently the stretched focal zone) in transducer elevation lateral direction, corresponding to the tube axial direction (for circumferentially positioned probes), should be calculated keeping in mind that there is only one component performing focusing in this direction, and this component is the lens itself. The lens curvature (and subsequently the stretched focal zone) in transducer azimuthal lateral direction, corresponding to the tube circumferential direction, should be calculated taking into account that there are two components performing focusing in this direction: the lens itself and cylindrically concave inner surface of the tube, which works as a second focusing acoustic lens. The required computations can be done using e.g. geometrical acoustics approximation and method of imaginary (virtual) acoustic source (probe). Emphasize that even standard spherically focused angle transducers do not have the focal points after refraction on flat, cylindrical or spherical surfaces, because for angle probes, such surfaces distort the converging wave front transmitted by the transducer. In order to obtain the focal points for angle probes after refraction on flat, cylindrical or spherical surfaces, the working surface of the transducer should have a more complicated curved shape. For example, to create the focal point after angle refraction at the flat surface, transducer should have an elliptical focusing surface in transducer lateral elevation direction and spherical focusing surface in transducer lateral azimuthal direction. Figs. 13 and 14 schematically show acoustic fields created respectively by spherically and elliptically focused immersion angle probes in transducer lateral elevation direction (in Figure plane along the refraction surface) after angle refraction at the surface water/metal. Note that probes should be spherically focused in transducer lateral azimuthal direction (perpendicular to Figure plane). It is clear that in order to create a focal point after angle refraction, the incident acoustic beams should impinge the refraction surface at different specified angles, which depend on the transducer position, orientation and surface shape. Moreover, acoustic waves from different directions should come to the focal point in-phase in order to create the constructive interference. This factor also should be taken into account during calculation of probe position and orientation. All these parameters can be determined applying rather simple algebraic equations based on method of geometrical acoustics and method of imaginary acoustic source. For curved refraction surfaces the probe's profile will be more complicated than the elliptical one shown in Fig. 14. Figure 13. Schematic of acoustic field of spherically focused immersion angle probe in transducer lateral elevation direction (in Figure plane along the refraction surface) after angle refraction at the surface water/metal. Figure 14. Schematic of acoustic field of elliptically focused immersion angle probe in transducer lateral elevation direction (in Figure plane along the refraction surface) after angle refraction at the surface water/metal. Computation of position and shape of the probe, creating the required acoustic field, is a synthesis problem. It can be solved in two stages applying beam trajectories and refraction law. At the first stage, using just geometrical acoustics, one should determine position and shape of the "imaginary" probe, replacing the real one, located within the metal and creating the desired acoustic field. At the second stage, using Snell's law and geometrical acoustics, the position and shape of the real transducer, located in water and creating the required field should be determined. Sometimes it is more convenient to use another computation method, which allows determining directly the shape of the probe by solving the system of two algebraic equations. These equations are based on the geometrical acoustics and refraction law for beam trajectories, and also time-of-flight and wave phase calculations for different acoustic beams. Recall that in order to obtain the needed acoustic field, probe should be focused differently in two lateral directions: azimuthal and elevation. To calculate the shape and position of transducer with logarithmic lens for tube inspection, i.e. forming a narrow weakly diverging acoustic beam in azimuthal and elevation directions within the tube wall, one can use similar but, of course, more complicated computations. Different "quasi-tomographic" techniques, described in sections 3.1-3.5, allow rather accurately characterizing and sizing a flaw. The ability to "see" a flaw at various angles using different waves (longitudinal and shear, transmitted and reflected), methods (PE and PC), and probes (normal and angle), allows determining flaw shape, orientation and dimensions. Circumferential CW+CCW PE B-scan with simultaneous transducer rotation, correlated with flaw circumferential position (section 3.4), allows obtaining flaw images depicting the real flaw shape. It allows "seeing" the flaw tip and sides at different angles in reflected longitudinal waves and "reconstructs", to some extent, its shape during one scan. It gives an opportunity to determine the flaw orientation and shape, estimate its width and depth, and help in flaw tip radius evaluation. The "combined" technique, presented in section 3.5, gives the opportunity to obtain the flaw image, containing simultaneously CW, CCW and PC responses. Of course, all methods described in sections 3.1-3.5, can be applied not only to circumferential, but also to axial positioned transducers. Moreover, all these techniques and probes can be used for flaw detection, characterization and sizing not only in tubes, but also in other different objects. Special probes with logarithmic lenses, used for scanning, had a stretched focal zone, i.e. created a narrow weakly diverging acoustic beam. As a result, these transducers provided characteristics necessary for "quasi-tomographic" testing: large inspection range, high resolution, sensitivity and low noise level. At the same time, they are small, simple and inexpensive. Since tubes are straight in the axial direction but curved in circumferential one, the bi-curved transducers, focusing differently in two probe's lateral directions (azimuthal and elevation), should further improve resolution and sensitivity of "quasi-tomographic" testing of tubes. Computation of such probes shapes can be based on the geometrical acoustics and refraction law for beam trajectories, and also on the time-of-flight and wave phase calculations for different acoustic beams. Sometimes results of the UT inspection of tubes are not satisfactory due to insufficient sensitivity, inability to characterize a flaw (i.e. determine its shape) or size a flaw. It is very difficult, even using various techniques (PE and PC), waves (longitudinal and shear, transmitted and reflected) and transducers (normal and angle) to determine defect shape and orientation, measure shallow flaw depth, detect cracks (particularly the tight ones), find areas with material morphology variations, and so on. Only tomographic method, as the most accurate and reliable one, could allow solving all these problems. At the same time, the UT tomography is a very complicated and expensive technique, and it is now on the development stage only. That is why it is worthwhile to develop something like "quasi-tomographic" approach to tube examination, which could significantly improve the inspection capability by employing only some simple tomographic techniques. In order to realize the potential advantages of the UT tomography (high detectability, sensitivity, accuracy, resolution, etc), one should use narrow weakly diverging acoustic beams. Only such beams, narrow within the specified insonification range, can provide the required inspection parameters, because wide acoustic beams entail significant acoustic noise, give low amplitude responses, and do not allow accurately sizing or locating the internal flaws. Transducers, transmitting such narrow weakly diverging acoustic beams, should be at the same time small and simple to provide all-round insonification of the tested object from different points and at various angles. Novel recently developed piezo-transducers with "logarithmic" acoustic lenses can satisfy all these requirements. They have a stretched focal zone, i.e. form narrow weakly diverging ultrasonic beam within the desired insonification range, providing high lateral resolution. In addition these transducers are single-element, simple, small and inexpensive probes. Since tubes are straight in the axial direction but curved in circumferential one, the bi-curved transducers, focusing differently in two probe's lateral directions (azimuthal and elevation), should further improve resolution and sensitivity of tube testing. Computation of such probes shapes can be based on the geometrical acoustics and refraction law for beam trajectories, and also on the time-of-flight and wave phase calculations for different acoustic beams. To realize "quasi-tomographic" technique, one should apply different methods, which allow "seeing" a flaw at various angles by changing the incident angles for different probes. In addition, images obtained by using different transducers and methods, should be combined. Shear wave two-skip axial and circumferential PC techniques, particularly at large incident angles, allow not only detecting the flaw and estimating its width and depth, but also determining to some extent the shape and orientation of the flaw. Shear wave one-skip axial and circumferential PC techniques also give the possibility to detect the flaw, estimate its width and depth, and approximately determine shape and orientation of the flaw. Shear wave axial and circumferential PE techniques, particularly at small incident angles, allow not only detecting a very shallow flaw, but also estimating its depth by measuring time interval between responses from ID/flaw corner and flaw tip. Circumferential CW+CCW PE B-scan with simultaneous transducer rotation, correlated with flaw circumferential position, allows obtaining flaw images depicting the real flaw shape. It allows "seeing" the flaw tip and sides at different angles in reflected longitudinal waves and "reconstructs", to some extent, its shape during one scan. It gives an opportunity to determine the flaw orientation and shape, estimate its width and depth, and help in flaw tip radius evaluation. "Combined" image, containing axial or circumferential shear wave PE and PC responses, allows determining pretty accurately flaw shape and orientation and "reconstruct" the flaw. Moreover, the amplitude and length of PE and PC responses are proportional to magnitude of flaw tip radius; therefore this method can probably be used for flaw tip radius estimation. Karpelson A. 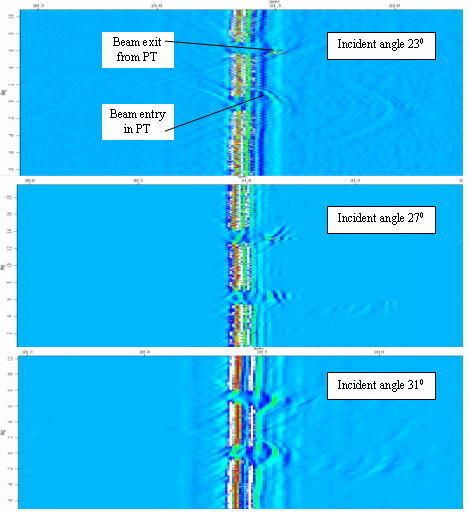 "Piezotransducers Creating Narrow Weakly Diverging Ultrasonic Beam", The e-journal of NDT, vol. 7, No. 6, June 2002. Dolbey M. P. "CIGAR - An Automated Inspection System for CANDU Reactor Fuel Channels", proceedings of the 8th International Conference on NDE in the Nuclear Industry, Kissimmee, Florida, November 17-20, 1986. Tinkler M. J., Dolbey M. P., Donnelly D. W. "Inspection: in Situ Profilometry and UT Techniques", Fuel Channel technology seminar, Toronto, Ontario, Sep. 10-12, 1996.